It’s a brand new year and I’ve got some great news to share! I’ll be hosting a new show, Momma’s Recipe Makeover, where viewers will be giving me their favorite family recipes for a healthy make-over but keeping the good old-fashioned taste! Health & Wellness Channel is North America’s only one-stop-shop cable network for all things life, love and longevity to begin airing on cable first quarter 2012. So stay tuned to find out when and where it airs by subscribing to my Stay In The Loop newsletter or LIKE my Facebook page. 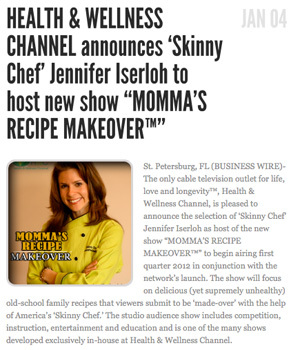 St. Petersburg, FL (BUSINESS WIRE)- The only cable television outlet for life, love and longevity™, Health & Wellness Channel, is pleased to announce the selection of Skinny Chef Jennifer Iserloh as host of the new show “MOMMA’S RECIPE MAKEOVER” to begin airing first quarter 2012 in conjunction with the network’s launch. The show will focus on delicious (yet supremely unhealthy) old-school family recipes that viewers submit to be ‘made-over’ with the help of America’s ‘Skinny Chef.’ The studio audience show includes competition, instruction, entertainment and education and is one of the many shows developed exclusively in-house at Health & Wellness Channel. “We cannot be more excited to have Jennifer as part of the team. Her extensive media platform gained from working with authors like Jessica Seinfeld and her own development of the very successful ‘Skinny Chef’ brand positions Jennifer to be a break-out sensation for our first season and many to follow. We’re delighted to have made this deal,” said HWC founder Drew Nederpelt. Congrats; I am so happy for you!!! This is amazing news and I cannot wait to hear more. AWESOME Jen! So happy for you and GREAT concept – it will resonate with so many folks! Thanks for the lovely words Tevis!! Hope all is well, would love to hear how your work is going!